The first Indian bishop of the Anglican Church in India, Vedanayagam Samuel Azariah was born in 1874 in a small village in one of the most economically deprived areas of South India (now in the state of Andrha Pradesh), the son of Thomas Vedanayagam, an Anglican priest, and Ellen, a woman with a deep love and understanding of the holy Scriptures. Samuel became a YMCA evangelist at 19 and secretary of the organization throughout South India only a few years later. He saw that, for the Church in India to grow and to bring ordinary Indians to Jesus Christ, it had to have indigenous leadership. He helped create the Tinnevelly-based Indian Missionary Society in 1903, and was a co-founder of the National Missionary Society of India, an all-India, Indian-led agency founded in December 1905. Atthe age of 35, he was ordained to the presbyterate, and three years later (December, 1912) he was consecrated as the first bishop of the new Diocese of Dornakal, with 11 bishops of the Anglican Church in India participating in the liturgy at St. Paul’s Cathedral in Calcutta. 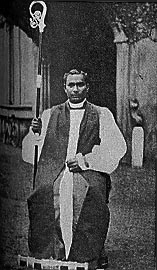 Bishop Azariah was the first Indian to be consecrated a bishop in the Churches of the Anglican Communion. As bishop, his work moved from primary evangelism to forwarding his desire for more Indian clergy and the need to raise their educational standards.By 1924, the ordained leadership of the Diocese of Dornakal included 8 English-born priests and 53 Indian clergy. Bishop Azariah was also an avid ecumenist and one of the first to see the importance, indeed the necessity, of a united Church to mission and evangelism (a passion that would be taken up by others in India, like the missionary Lesslie Newbigin). Bishop Azariah died on January 1, 1945, two years before the inauguration of the united Church of South India (CSI). There was great evangelical moment during his tenure. At the end of his life the Diocese grew to 240,000 Christians. Over the past 85 years the Diocese has been involved in many activities like evangelism, establishing educational institutions, hospitals, and homes for orphans and people with disabilities. The Diocese is very active in spreading the gospel and evangelism among non-Christians. Bishop Azariah established Dornakal Diocesan School for girls, later Bishop Azariah High School for Girls. The Bishop Azariah College in Dornakal is also named for him and is the only college in the Diocese of Dornakal, Church of South India (CSI). The college was established with the objective of providing education to both Christians and non-Christians. Emmanuel, God with us, making your home in every culture and community on earth: We thank you for raising up your servant Samuel Azariah as the first indigenous bishop in India. Grant that we may be strengthened by his witness to your love without concern for class or caste, and by his labors for the unity of the Church in India, that people of many languages and cultures might with one voice give you glory, Father, Son, and Holy Spirit, now and for ever.Amen.